Democratic presidential hopefuls traded barbs over the war in Iraq, with former Sen. John Edwards blasting two rivals for not taking the lead on a recent spending bill. How did the candidates rate? See our analysts' picks, then make your own choices. Listen to some of the verbal wrangling among the Democratic hopefuls in New Hampshire. 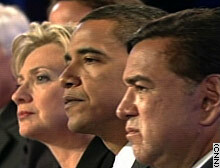 Audience members questioned the candidates; did they like the answers they got? Saint Anselm College swirled with activity as the event got under way. See how much the candidates have raised and spent, and how much cash they have on hand. Save the debate to your desktop or personal video player to watch again and email to friends. Analysis: First-in-nation primary is a must-win for one Democrat, two Republicans. Full text of the Democratic debate as well as pre- and post-debate analysis. • Should U.S. boycott Beijing Games? • Watts: Biden's breakout performance?